Turf grass is are complex plants that need 5 basic necessities for optimal health. Sunlight, soil, nutrients, water, and careful maintenance. With these 5 basic steps, grass can become dense, green, and visually appealing. Weeds and bare patches can be prevented by proper lawn care, mowing and watering correctly, and watering and fertilizing the lawn. Mow the lawn as it is needed. Cutting around a height of 3 inches or more work best. In general the longer the top growth, the deeper the root system which creates a healthier stand. Don't cut more than 1/3 of the total plant. This will put more stress on the plant and lose more moisture. Keeping the blades sharp will also help reduce the amount of stress. Water too much or too little can also do more harm than good. Watering is not needed in the spring months when the soil is moist from the spring rainfall. During the summer months when watering is needed, only water during the morning. Try to avoid watering during the day which will not be as effective due to evaporation and possibly windy conditions. Water in the evening is also not recommended because it allows moisture to remain on the plant overnight and makes the grass more susceptible to disease issues. During the hot summer months water each area of the lawn with at least 1 inch of water. Fertilizer is food for your grass. Some fertilizers are better than others. Too much can be as damaging as too little. Before applying any fertilizer, ideally you would like to start with a soil test. This will tell you the pH level as well as the level of the nutrients of the soil in which it may be lacking. Using a well balanced fertilizer every 6 weeks or so can help maintain the lawns overall health and keep it green all summer long. Grass, like most all plants needs sunlight for photo synthesis, which is a chemical process that converts carbon dioxide into organic compounds, especially sugars, using the energy from sunlight. 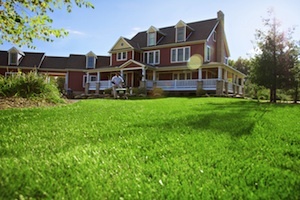 Research has shown the most grass varieties require at least 4 hours of direct sunlight per day. The shaded lawns tend to attract moss, fungi, and weeds. Trimming back any tree limbs and shrubs that block direct sunlight from reaching the lawn will help. If you can't get the desired amount of sunlight, consider using a shade-tolerant grass variety.